When their two soybean crops failed in two consecutive years, farmer Raj Kumar Rathore tried to convince his parents to experiment with other crops. But it only angered them. They were not ready to give up farming the traditional crop of Madhya Pradesh’s Sehore district. He was ousted from the family and given seven hectares (ha) of his land share. That was way back in 1997 when he was still graduating from the local college. 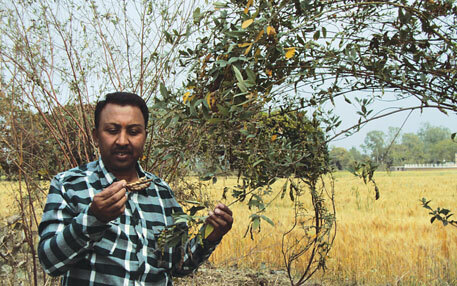 Today the 45-year-old has a unique variety of pigeon pea (arhar) plant to his credit (Richa-2000) which he has named after his daughter and an award from the National Innovation Foundation (NIF). These apart, he earns around Rs 5 lakh every year from selling it. “Back then, people would laugh at my idea of planting pigeon pea in the farm. But I persisted,” he says. Cultivation of pigeon pea is cheaper than that of soybean. The seed rates of soybean and pigeon pea are almost the same, but a farmer needs at least 88 kg soybean to cultivate a hectare. 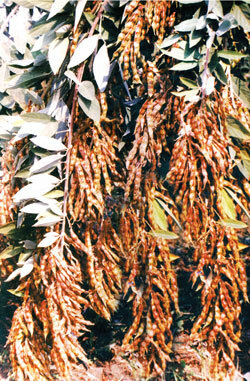 Only 15-18 kg pigeon pea seeds are required in the same area of farm. Besides, soybean is vulnerable to water. Excessive rainfall can ruin the crop, so farmers have to sow seeds again and again. The cost of fertilisers and pesticides are also high in soybean crop. “I had taken a huge risk, so I had to take a lot of precautions. I sowed government-approved ICPL-87 variety of pigeon pea seeds on my land and would visit the field every day to study the developments. From purchasing seeds to sowing and then caring for them was a fascinating experience,” he says. During the daily inspections, he found a unique plant that was a feet taller. When its flowers bloomed, he noticed that they were black instead of the usual yellow. Its fruits, too, grew differently. They grew in bunches and were black. When April came, all the plants wilted and dried, but this one stood tall. Curious, Rathore went to Rafi Ahmed Kidwai (RAK) College, an agricultural college in Sehore, and showed it to Indu Swaroop, a teacher there. She said it was a rare breed of pigeon pea and should be preserved. The plant, she said, could be the result of natural mutation of existing plants. K S Pawar, another teacher of the same college, echoed her views but said only time will tell whether the plant was better than the existing one. Rathore returned to his farm and protected the plant under a net. It had very few branches, which meant very few pods of the legume. But their quantity and quality could not be contested. He removed the plant from the farm after they bore pods and stored its seeds. The next year, he decided to sow them at a distance from each other to observe the plant’s growth and characteristics. Around 22 plants were grown on the farm’s boundary. It yielded 80 kg pigeon pea. “Generally, ICPL-87 yields 300-400 kg in an acre (0.4 ha) but with at least 15,000 plants,” he said. To increase the number of branches of the plant, he met many experts but their ideas did not show results. One day, while checking his unique plants, he saw an old woman working in the farm plucking out the top of the plant. This, she said, would help the plant branch out better. Despite knowing this concept of apical dominance, he had failed to use it. He started plucking out the top of the plants in regular intervals. Soon, 12 to 14 branches had emerged from one plant. THE USP of the plant was revealed due to his laziness. That year he became careless and did not cut the plants. But the pods emerged again. “This was a pleasant revelation. Nobody in the area had ever seen any pigeon pea plant bearing pods more than once a year. I was curious to know how long it could yield. One plant bears legumes four to five times,” he says. Harvesting is also easy because the pods come out in bunches at the tip of each branch. To get his work noticed by scientists, in 2000 he took his seeds to RAK College. But the scientists there ridiculed and discouraged him. Yet they contacted him many times to coerce him into giving his seeds to them. “They told me that since I could not release the seeds on my own, I should give it to them,” he says. In 2002, he sent some seeds to Banasthali Vidyapeeth, Rajasthan, but did not get any response from there either. Neither did he get any response from Indian Council of Agricultural Research. “In 2003, representatives of NIF approached me after reading media reports, and in 2007 they awarded me for my work,” he says. NIF gave the award after sending the seed samples to all big institutions to check if anything similar existed, says Vipin Kumar, chief innovation official with NIF. When S P Shukla, the then official at Indian Farmers Fertiliser Cooperative in Bhopal, read about his achievement he took about 250 grams of seeds from Rathore and distributed them among farmers in Rajkot, Junagarh and other areas. As many as 200 plants developed from those seeds which yielded 150 kg seeds,” he says. Shukla is scientist who retired in 2010. The variety is now being sold in Bihar, Uttar Pradesh, Maharashtra, states of south India and even Nepal. The market can still be expanded but Rathore does not want that. Over-cultivation, he says, may destroy the purity of the plant. Wonderful story, one wonders, how many such innovations and discoveries are lying hidden in our rural heartland. Kudos for Mr. Rathore to not give up and continue to study and grow the Magic pod. Can I have the address of Mr.
Can I have the address of Mr. Raj Kumar Rathore so that I can procure some seeds from him to be tested in Bankura district of West Bengal where I have been working with tribal women/farmers on behalf of CWDS, New Delhi & Nari Bikash Sangha, Jhilimili? I am one of the oldest subscribers of Down to Earth. Variety is good but we need detail information about Richa 2000 variety of arhar.